The Joint Commission International (JCI) is a U.S based accreditation body dedicated to improving healthcare quality and safety around the world. The accreditation is an international gold standard for hospitals and has been so far achieved by only 24 hospitals in the world. JCI works directly with healthcare organizations to achieve their goals of providing quality clinical care and services in safe, efficient and well-managed facilities. Health Assessment and care processes. Education and rights of individuals. Management of information and human resources. Education & Rights of patients. Hyderabad June 30th, 2006: The Joint Commission International (JCI), USA the leader in accreditation and certification of health care organizations in the world has announced the accreditation of Apollo Hospitals, Hyderabad. For the first time in the world, JCI has also certified the hospital for its Acute Stroke (Brain attack) Program. This was announced , today at Hyderabad by the Executive Chairman of Apollo Hospitals Group, Dr Prathap C Reddy. Quality in Healthcare and Apollo Hospitals have been synonymous over the last two decades. This fact has been reiterated by Joint Commission International (JCI), USA, the most reputed and respected healthcare accreditation body in the world. Apollo Hospitals, Hyderabad is the third in the chain of Apollo Group of Hospitals (Delhi & Chennai are the others) to be accredited by JCI. Global experts in healthcare from JCI audited the hospital for 1033 standards focusing on patient safety, quality improvement, infection control, staff qualification and training, care of patients and other critical areas and certified that the hospital met all the 1033 standards required for JCI accreditation. Mrs.Maureen Potter, Executive Director, International Accreditation, Joint Commission International in her note said "The citizens of India should be proud that Apollo Hospitals, Hyderabad is focussing on this most challenging goal - to continuously raise quality to higher levels". In addition to hospital accreditation, Apollo Hospitals, Hyderabad is the first hospital in the world to receive JCI certification for it's Acute Stroke (Brain attack) Program. Disease specific certification involves the use of a standardized evidence based treatment protocol for that particular disease and every patient coming into the hospital with that particular disease has the same protocol being applied. This apart from ensuring uniform standards of care all times brings down the cost of treatment and significantly improves clinical outcomes. Ms.Carla Cassidy, the JCI surveyor for the stroke program wrote in her report "The use of evidence based criteria in the planning and execution of stroke care is a model for the country to emulate". The process of accreditation and post-accreditation surveillance ensure continuous focus on patient safety and quality improvement. This we believe is the most significant contribution of JCI and has a positive impact on patient care. According to Dr Prathap C Reddy, Executive Chairman, Apollo Hospitals Group, JCI accreditation for Apollo Hospitals, Hyderabad is a significant step in establishing Indian healthcare on the global horizon. It will contribute in the process of enhancing confidence in the Indian healthcare system on the international front and will help in bringing in more international patients. Joint Commission International (JCI) is the overseas arm of USA's main hospital accreditation agency. It is considered as the American mark of quality health care and is the leader in accreditation and certification of health care organizations outside USA. JCI gives ratings in various areas such as patient safety and service standards. The globalization of Indian economy and the liberalization policies initiated by the Government in reducing trade barriers and providing greater thrust to exports makes it imperative for Accredited Laboratories to be at international level of competence. (www.nabl-india.org). 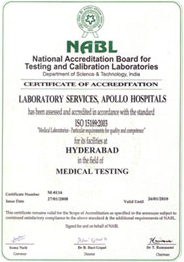 Apollo Hospitals, Hyderabad received NABL accreditation for lab services. Apollo has always been forerunner in setting highest standards in quality and patient care. This accreditation is yet another achievement in our constant endeavor to provide the best of care and precision in diagnostics. The International Organisation for Standardization (ISO) is a network of the national standards institutes of 151 countries, on the basis of one member per country. A Central Secretariat based in Geneva, Switzerland, co-ordinates the system. Apollo Hospitals, Chennai was the first hospital in India to be awarded an ISO 9002 certification. The ISO standards are a guarantee of quality across boundaries and geographies. They are an assurance to the international patient of the safety and reliability of Apollo's services against global benchmarks. The Indian Consumer Superbrands Council includes some of the most eminent marketing, media and advertising professionals. As the council members agree, "Obtaining Superbrands' status puts the brand in the circle of an elite group that is seen to represent the best practices in brand management; ultimately it is the brand Oscars."